B55910-6030-SS is rated 3.4 out of 5 by 9. The Delta® Curved Frameless Tub/Shower sliding door with a sturdy, stainless steel guide rail system is the first frameless sliding curved door in the retail aisle. With no bottom track, middle support or side wall jambs, this door is easy to clean and the FlexStrip™ low profile, flexible water barrier keeps water in the tub. The antimicrobial coating on the FlexStrip™ water barrier helps to reduce stain and odor causing microbial growth on the surface of the water barrier so it stays cleaner longer. 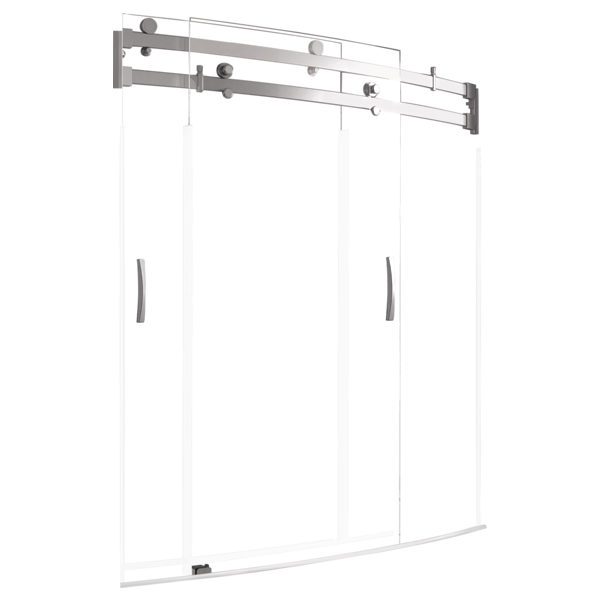 The sleek industrial modern design of the curved door coordinates with a variety of styles. Rated 4 out of 5 by Helene from Love the beauty it brings to the bathroom I love the doors but like the other reviews I have read I am having the same problem with the rubber dam coming off easily. I have tried several adhesives also. I also do not like the water gaskets as they tend to grow mold behind them. They should come out with a design of a water gasket that can be slid onto the bottom of the glass doors that actually sit in the tub area and are removable for cleaning this would remove the need of the dam. I need replacement parts and don't know where to get them. 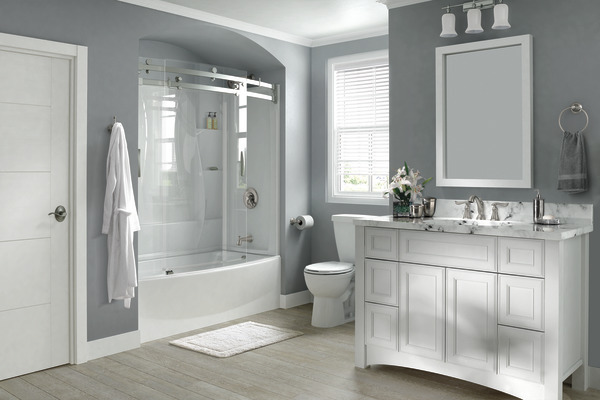 Rated 3 out of 5 by Niez15 from Beautiful with some Issues I purchased this door with the the curved bathtub. Love the bathtub! Installed this door and several issues. The door looks beautiful as long as I don’t have to open the outer door. Installed this door exactly according to the measurements/template provided, which was a mistake. 20/20 hindsight after reading all the Home Depot Reviews I would have added at least an 1/8 inch. The outer door drags terribly despite adjusting the rollers. After trying multiple workarounds I am going to have to redrill and remount the door. The other two issues I ran into was a missing piece for the handle and the rubber stop. I installed this door 2 days ago and the rubber piece is already starting to fall off. Before taking any additional steps I will wait to hear from Delta. I’ve always had good experiences with Delta’s products in the past, so I’m hopeful. Rated 5 out of 5 by Brent from Looks great and operates well I have put three of these in different properties. my only complaint is actually more of that with the delta tub. 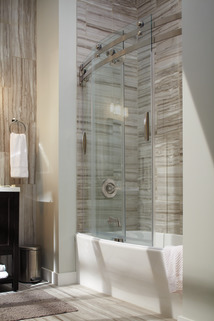 Having to seal the lip on the tub to prevent water leaking takes away from what would otherwise be a perfect shower door! I wish the classic curve tub came with a lip/ bump fabricated into it where a small gap by the walls could just get caulked vs. this rubber lip... lip will come off well before rest of tub goes and just looks cheap. 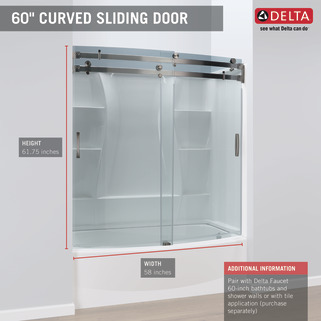 Rated 3 out of 5 by mommof44 from Rubber strip falls off although we love our Delta 400 curved shower door we are having a huge problem with the rubber strip. We followed the directions to a T and still every time we shower that strip comes off and water gets all over the floor. Do you have a suggestion on how to make this not happen or do you have a suggestion of a stronger adhesive that would hold the rubber strip but not harm the tub? Rated 2 out of 5 by Msmak from Annoyed customer I bought these doors with the matching tub. My contractor drilled the holes according to your directions into my tiled wall to put up the track system. The track was sticking and the doors would not slide properly. We went to the home depot site and began to read reviews from other customers who had the same issue. Some contractors recommended buying washers to help rectify the problem. The doors were taken off and the sheets that you guys supplied were placed back on the sides to make sure the holes were in the right place. Long story short your diagrams as to where the holes should go are wrong. The holes need to be moved up. So now tile needs to be removed, replaced and regrouted. This has cost me extra money. These doors are not cheap and contractors time isn't cheap either. I have to pay them for their extra time also. Putting the doors up, taking them down, finding the issue and putting the doors back up. Only to take them back down repair tile and put them back up. Your company should read the home depot reviews and make adjustments to your installation manual. Rated 1 out of 5 by Jen07 from The door itself is beautiful but the water dam and the middle piece is garbage. I just installed this door in my newly renovated bathroom. I must say it looks beautiful but what a piece of garbage. I don't understand how you will build something so nice with the new frameless technology and put a strip with adhesive and expect it to stick. I don't know maybe the piece came damaged, but Delta is sending me a new one. Hopefully I will have better success with it becuase if it doesn't work, I will be returning this item. Poor design. Can you get this door in Rain or anything other than clear? What are the dimensions of the shipping box? One of the plastic water diverters came off from a shower door. How can it be reattached? Does Delta sell a towel bar that matches the hardware on the Classic 400 Curve 60 in. x 62 in. 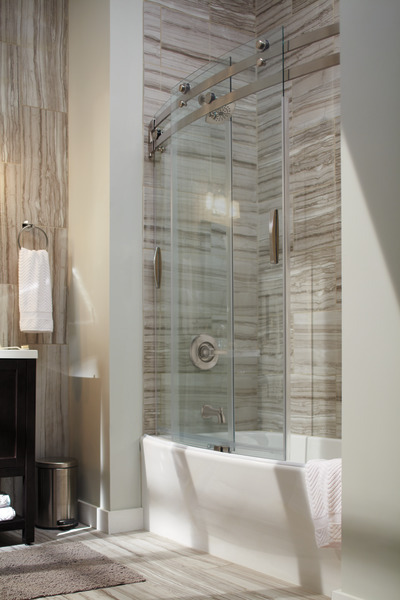 Frameless Sliding Tub Door? Could I install one side to a glass wall? I like to install to a tile wall on one side and glass wall on the other (8mm)? And are there fasteners to install onto the glass wall? Thank you. One of the doors we cannot get to roll smoothly. The left/front door rolls without a problem, but the right/back door continues to stick. Initially it only stuck slightly, but now can barely get the door to roll. What if my tub isn't curved will this door still work ?